Goathland Plough Stots. Whitby, north Yorkshire England. 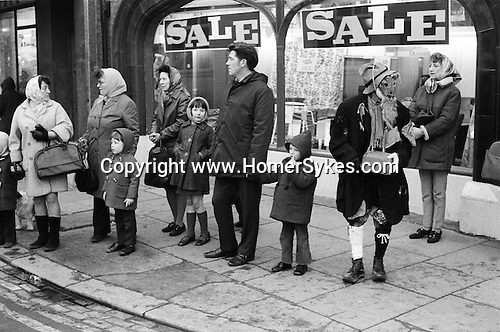 1972 Old Isaac collecting alms in Whitby. Jackie Watson writes of her grandfather, William Breckon Noble aka Napper who played Old Issac (T'awd Man) from 1923 until 1975. Napper was born in the Goathland area in November 1898, the fourth child of seven children to William Thomas Noble and Rebecca Breckon. As an adult he spent many years as a Handyman & Gardener in local hotels, before moving to Grosmont with his wife and two daughters to work as a bricklayers labourer for Harrison's of Grosmont. On his retirement from The Stots, Napper was presented with a mini wooden Plough with an inscription thanking him for the many years he dedicated to the G.P.S. Nappers brother Ralph Noble played an instrument for The Stots (I believe it was the fiddle) for a few years as well. Nappers nephew Steve Peirson has carried on the Stots tradition now for many years playing the accordion.